« Eventually, food banks will have to go bust. This is advice we hear all the time. If you’re a motivational speaker then this will be your core message. The fact that businesses pay huge sums of money to motivational speakers to drive home this message with their workforce suggests it’s safe to assume that this position is beyond question. Clearly, this is how humans were meant to improve themselves. But is it? I’m not so sure. Look at graph A. The y-axis represents the highs and lows of life from the extreme high (say winning the lottery or achieving a lifetimes goal) to the extreme low (say being diagnosed with a terminal illness or losing everything due to war). The line in the middle is the mean and 0 represents the perfect level of comfort – however you wish to define that. The mean should not be derided – we wouldn’t be here if the universe didn’t have a comfort zone. Planet earth exists on this mean line – neither too hot nor too cold, a miracle really considering the unimaginable extremes of the universe. As human beings, we understand the environment through comparison – to our touch fire is too hot, ice is too cold and blood temperature is just about right. For every positive, we compare it to a negative and everything exists on this continuum. 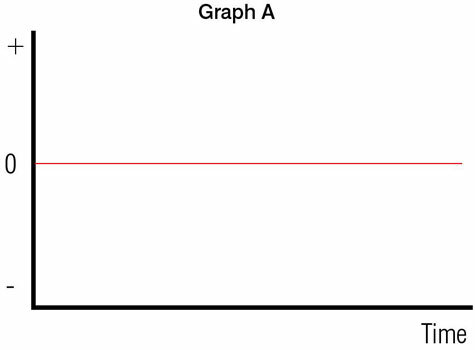 Let’s go back to graph A. The motivational speaker encourages the audience to achieve goals that attain these spectacular ‘highs’ on the positive side of the mean. What is rarely mentioned is that for every move higher there will potentially be a corresponding move lower in emotional response, and the higher you go the lower you can go too. This has to be the case. If you’ve set your heart and soul on achieving a particular goal (how great it will be to achieve this!) and you fail to achieve it, your disappointment will be proportional to the desire you had in wanting to achieve it. If your disappointment is not too great then the logic dictates that you couldn’t have wanted it that badly in the first place. 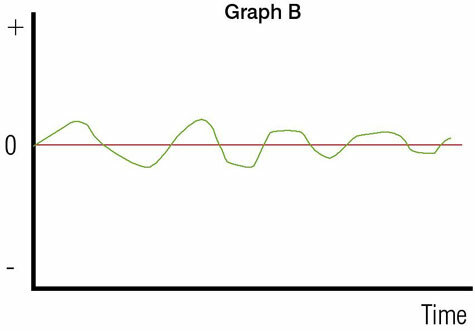 Hence, any idea of living your entire life in the positive side of the mean is an illusion because we can only make sense of the world through comparison so the mean in the graph would have to be shifted upwards and the graph recalibrated so that 0 appeared higher on the y-axis so that some experiences fell into the negative half. 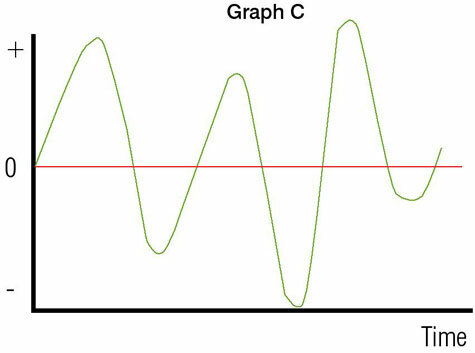 Most people live their lives similar to graph B where the peaks and troughs are minimised (I’m making this extrapolation from the existence of an industry that actively encourages a pursuit of the bigger peaks and troughs) whereas the ‘special’ people— for example, risk-taking cave divers or mountain climbers, live their lives similar to graph C.
Which is the preferred graph? The thing we definitely don’t want to experience is a flat line – the undeviating line of the mean itself. In medical circles ‘flatline’ is a sign of death. If you were perpetually comfortable, your body and mind would protest. Sensory deprivation is anathema to our brains – it needs some stimulus thus it’s easy to see where the idea of stepping out of our comfort zones originated—doing so provides stimulus for our brain. So being perpetually comfortable is practically impossible. Before long, it would become uncomfortable through lack of stimulus. Most people however, don’t require an enormous amount of stimulus. If you look at graph C and consider it in terms of food intake, it doesn’t look very attractive; imagine many days of fasting followed by uncontrollable binges. It could be argued by a motivational speaker that the longer the fast, the more out of your comfort zone you are (is that a good thing?) and that when you do eventually eat, the food will taste better as a result of your extended fast. Presumably, this is ‘living life to the full’ and should be advocated by life coaches but as far as I’m aware, it’s not often on their agenda. Why is this? Is it because it is probably healthier to be more moderate with your food intake? If this moderate principle applies to food, why is it not extended to other areas of our lives? In fact, why is the desire to experience life to the full with extreme goals seen as healthy at all? Maybe the entire premise of ‘motivation’ is misguided? When a goal is achieved or a disaster experienced, where is the impact of it most keenly felt? – In the mind. It is our mindfulness that dictates how we experience existence. We feel ‘amazing’ or ‘gutted’ because our minds create the emotion. 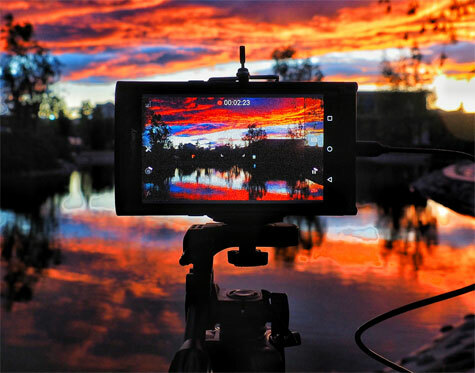 ‘Motivation’ is an ersatz way of accessing the mind, like viewing the world through a low-resolution screen instead of looking at the real thing unobstructed. Why not focus directly on the mind? Stop reading now and pay close attention to what you can hear, listen for every nuance of sound, find all the frequencies. This is as good as it gets. You’re alive! By learning to be more aware of the now, we can appreciate the ‘simple’ things in life (listening to sounds might seem simple but when reflected upon deeply the unimaginable complexity of it becomes apparent). Action without thought is mindless. We need Mindfulness Speakers more than we need motivational speakers. This entry was posted on Saturday, January 14th, 2017 at 10:47 am	and is filed under General. You can follow any responses to this entry through the RSS 2.0 feed. You can leave a response, or trackback from your own site.